Staying Sharp provides science-based tools to assess your brian health in order to provide a personalized path to maintain and improve it. It's packed with information, activities and tools backed by the Global Council on Brain Health and designed to be both fun an effective. Ninety-three percent of Americans polled said that brain health is vitally important to them, yet were not certain what they could do to support their brain. In building Staying Sharp, AARP reviewed thousands of pieces of evidence-based research and literature from scientists around the planet to find the most effective path to maintaining a healthy brain. With this collected knowledge, we developed an online tool providing an easy to follow, holistic approach to improving brain health. With an AARP account, you can discover brain healthy articles, activities, challenges, and recipes that help you take control of your brain health. There is a lot of advice about brain health out there. That’s why AARP has collaborated with some of the best scientists in the field to form the Global Council on Brain Health, cut through the noise and bring you only those tools and information that are supported by science. In fact, many of our articles include links directly to the scientific studies and reports that support them. Check it out for yourself by joining today! Brain games are fun, and we think you’ll enjoy all of the brain games we have to offer on Staying Sharp. But improving and maintaining brain health requires a holistic approach. That’s way Staying Sharp provides tools and information across the five pillars of brain health for you to utilize. Staying refreshed, learning more, connecting with others, eating right, and keeping our bodies in motion have all been proven as effective ways of helping to maintain a healthy mind and healthy body, so we encourage you to take those steps above all others. Don’t forget—what’s generally good for the body is generally good for the brain! On Staying Sharp we have activities for people of all experience levels and interests to explore. We do our best to find all of the highest quality, evidence-based brain health research from all walks of life so you may build your own path to a healthy mind by choosing only the activities, recipes and other content that’s right for you. The Assessment measures the speed and accuracy of the way you think, the way you focus, the way you remember, and how flexible you are in the way that you make decisions. The tasks that are used in the assessment have been tested over many laboratories, and are used by doctors and clinicians all over the world. It starts with a cognitive test. 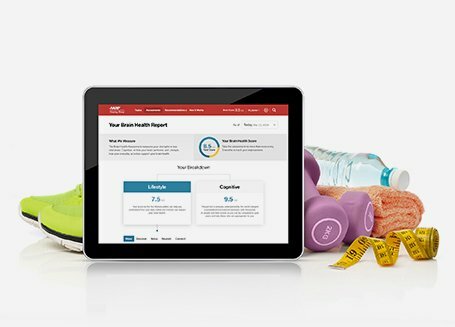 We combine a cognitive assessment and a lifestyle evaluation that has been designed to bring you a personalized pathway to recommendations that can empower you to train healthier brain habits. The Staying Sharp Brain Health Assessment is uniquely underpinned by the world’s largest standardized international database with thousands of people across age, gender, years and education, and their scores so you can be compared to people that are appropriate to your age and gender and years of education. The assessment takes 30-40 minutes, and we recommend taking it in one sitting for the most accurate results. Based on your Assessment, Staying Sharp will provide you with simple, personalized recommendations for improving your overall brain health. Want to go the extra mile or need a little help deciding what to do next? For a small extra cost you can take the Brain Health Assessment, which will provide detailed insights into how your brain works and how your lifestyle supports optimal cognitive function. No matter if you choose to take the Assessment or build your own path, Staying Sharp’s activities, recipes and articles make it easy to incorporate simple, fun, brain-healthy changes into your everyday routine, helping you maintain your brain over time. With tons of options like salsa dancing, game playing, and veggie sautéing, you'll never run out of interesting ways to build a stronger brain. Before long, these fun activities will become healthy habits and you will be well on your way to achieving optimal brain health. Join AARP and gain access to Staying Sharp today.